The just concluded regular legislative session that failed to produce a budget was more memorable for what did not happen than what did. There were many floor discussions and debates, but no votes cast on a host of issues that, had there been definitive action taken would have marked this session as one of the most remarkable in years. The House majority Democrats who ultimately control the agenda gave themselves oratorical platforms from which to express their views: on recreational marijuana, elimination of the electoral college, controversial violent conflicts between police and civilians and electronic tolls, to name a few. But no votes were taken because the votes to pass the bills did not exist. Democrats held sway from these soapboxes to speak to their constituents, all the while knowing this was pure political theater. The biggest non-vote of course, was on the only matter the State Constitution requires the legislature to resolve: balancing the budget. That awaits in a special session on a yet to be determined date as budget talks now proceed while the clock ticks on how to handle a $5.1-billion deficit for the next two years. As House Republicans, we have hewn to a consistent line: no tax increases whatsoever. And we have called the proposed state employee union concessions negotiated by Gov. Dannel P. Malloy insufficient to warrant extending the current fringe benefits package, including health care and retirement plans, another five years to 2027. Doing that would prevent future governors and five new legislatures from making substantive changes, when necessary, to prevent Connecticut from sinking deeper into the next fiscal abyss. During budget talks late in the legislative session Democrats accused us of caring more about the 2018 elections than solving the state’s financial dilemma. That’s funny because just a few years ago when the Democrats enjoyed huge advantages in the House and Senate they did not care much for Republican ideas or insist that we had to be part of the budget solution. In 2010 the House was dominated 114-37 by Democrats and for the last six years it has been all one-party rule by Democrats. Now, with a tied Senate at 18-18 and the slimmest Democratic margin in the House in 30 years, the panicked Democrats have sought to spread blame around for the state’s financial calamities and cry “politics’’ when we have disagreements over the budget. Democrats have acknowledged in recent weeks that they will likely need Republican votes to solve the budget crisis, and that may well be true. But if the final solution does include core elements of the Republican proposals the prospects of that are dim. In addition to the no-tax increase plan, House Republicans have endorsed a rock solid Constitutional spending cap, an honest bonding cap that will not commit future generations to more massive debt and structural efficiencies in state government. We sit at the negotiating table with Democrats and the governor focused on the current problems that the Democrats have failed to address for the last six years, not 2018. 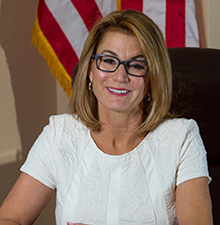 House Republican Leader Themis Klarides serves the 114th General Assembly District covering Woodbridge and parts of Orange and Derby.